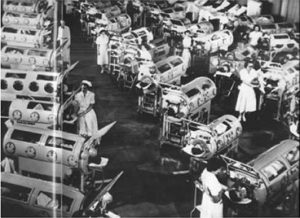 Called an Iron Lung, the negative pressure ventilator was a common tool used to treat polio when that disease was deadly and much feared. Poliomyelitis, which is often called polio or infantile paralysis, is an infectious disease caused by the poliovirus. In about 0.5 percent of cases there is muscle weakness resulting in an inability to move. This can occur over a few hours to a few days. The weakness most often involves the legs but may less commonly involve the muscles of the head, neck and diaphragm. Many people fully recover. In those with muscle weakness about 2 to 5 percent of children and 15 to 30 percent of adults die. Another 25 percent of people have minor symptoms such as fever and a sore throat and up to 5 percent have headache, neck stiffness and pains in the arms and legs. These people are usually back to normal within one or two weeks. In up to 70 percent of infections there are no symptoms. Years after recovery post- polio syndrome may occur, with a slow development of muscle weakness similar to that experienced during the initial infection. Polio is more common in infants and young children, occurring under conditions of poor hygiene. Because of complete or partial loss of muscle usage, people with polio had a difficult time breathing, which can cause a myriad of problems, including pneumonia. 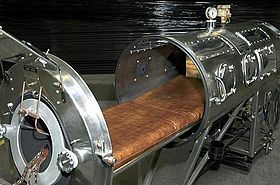 Enter the Emerson iron lung. The affected patient lies within the chamber, which when sealed provides an effectively oscillating atmospheric pressure. 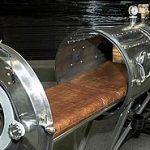 A negative pressure ventilator, or iron lung, is a nearly-obsolete mechanical respirator which enables a person to breathe on their own in a normal manner, when muscle control is lost, or the work of breathing exceeds the person’s ability, as may result from certain diseases. 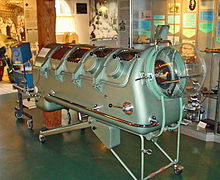 Polio was not the only disease that called for the iron lung. In addition to Polio, botulism and certain poisons, such as barbiturates, tubocurarine, also benefited from its use. Versions of the Iron Lung include both the Drinker respirator, the Emerson respirator, and the Both (Emerson-Drinker) respirator. The negative form of pressure ventilation…decreasing surrounding pressure to induce inhalation then re-pressurizing to 1 bar (15 psi; 750 mmHg)…has been almost entirely superseded by positive pressure ventilation (forcing air into the lungs with a pressure greater than 1 bar then allowing the body to naturally exhale before repeating) or negative pressure cuirass ventilation. 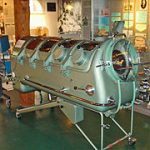 While the iron lung is not used anymore, it served a useful purpose in its day.